Jio Phone Booking Online | Offline: Reliance has announced Jio Phone Booking start from 24th August,2017, Thursday. Customer who are interested in Jio Phone Booking Online | Offline they all are Pre Book Jio Phone from online and offline mode. Jio Phone is launched by Reliance chairmen Sir Mukesh Ambani at 40th AGM conference. The Jio Phone will be available for free but customers have to pay Rs 1500 refundable amount. At the time of Pre Booking they have to paid 500 Rps and 1000 Rs at the delivery time. The total amount will be refunded after 3 years. 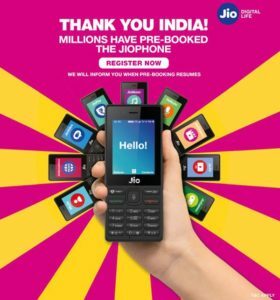 You can book the phone either online on jio.com and MyJio mobile application, or offline by walking into Jio retail stores, multi-brand device retailers and Reliance Digital stores. The payment for phone booking can be made through UPI, credit card, debit card and net banking. The phone is expected to be physically available from September. When you return your phone to Reliance Jio after 3 years, Jio Phone price is completely refundable. Jio has put out full specifications and detailed data plans for this 4G -enabled feature phone on its website. Customers won’t be able to use SIM cards from other telecom operators like Idea, Vodafone, Airtel etc.